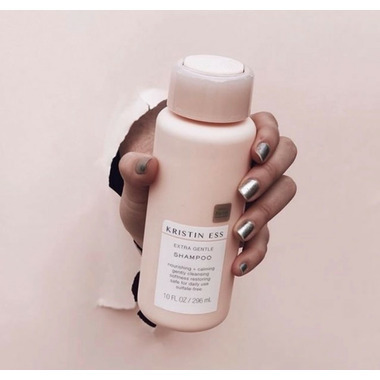 Since Kristin Ess has a sensitive scalp and skin herself, she knows it's important to have an option for those of us who need an extra gentle formula and a more subtle fragrance. This sulfate-free conditioner gently and thoroughly moisturizes, leaving your hair soft, shiny and perfectly smooth. 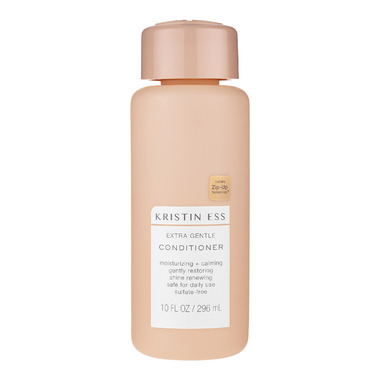 Try with the Kristin Ess Extra Gentle Shampoo! Soften and smooth the parts of your hair your natural oils cant reach. 2. On wet hair, apply from the bottom and work your way to the top. 3. Wait 3 minutes and rinse thoroughly. Tip: Not rinsing conditioner thoroughly can cause build up. Get in there, girl! Ingredients: Water, Cetearyl Alcohol, Behentrimonium Chloride, Panthenol, Chitosan, Litchi Chinensis Pericarp Extract, Gelidiella Acerosa Extract, Algin, Carrageenan, Coco-Glucoside, Hydrolyzed Keratin, Hypnea Musciformis Extract, Sargassum Filipendula Extract, Salvia Hispanica Seed Oil, Sorbitol, Cetearamidoethyldiethonium Succinoyl Hydrolyzed Pea Protein, Bis-PEG-18 Methyl Ether Dimethyl Silane, Cetrimonium Chloride, Guar Hydroxypropyltrimonium Chloride, Isopropyl Palmitate, Silicone Quaternium-3, Propylene Glycol Dicaprylate/Dicaprate, Cetyl Alcohol, Glycerin, Polyquaternium-37, PPG-1 Trideceth-6, Trideceth-12, PEG-8 Dimethicone, PEG-14, PEG-33, Caprylic/Capric Triglyceride, Xanthan Gum, Citric Acid, Methylisothiazolinone, Methylchloroisothiazolinone, Fragrance. I have been using the shampoo & conditioner for a few months and I really do feel a difference in the texture of my hair. So much softer. The smell isn't the "classic" Kristin Ess scent but it still smells AMAZING! !